Above we see a man who has been granted few opportunities to smile over the past 18 months finally getting an opportunity to smile. Even when being presented an unappreciative face and lewd gesture from a member of the opposition support, he doesn’t care. That’s the reaction of a man who scored two goals that day — his second and third goals since joining Sunderland in July of 2013, by the way. Look how wide he’s beaming. Unburdened. Freed. Relief. I can practically taste the joy. 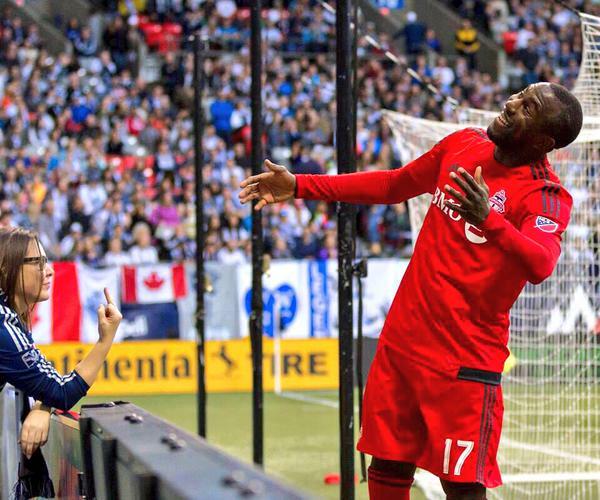 The moment, when shared by Toronto FC’s Twitter, was described as Jozy Altidore’s “Troll Face”. Maybe he was trolling bird-wheeling Whitecaps fan, Kirsty Olychick. Maybe he wasn’t. But either way, the moment captured in that photograph is awesome for more reasons than one — probably two if you ask Jozy.